Janice Rubis has been on Okinawa nine months. She from Phoenix, Arizona, and although she comes from a rather hot climate, she still thinks the best place during the summertime here is “any place with air conditioning.” She says that Okinawa is “pretty fu as there’s lots to do and explore.” On her free time she likes to check out new off-base restaurants and go shopping at \100 stores. 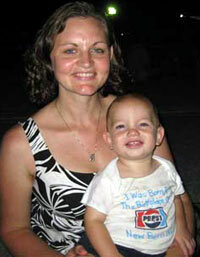 She is the winner of a gift coupon to Aroma Studio Inca. Haresh Hingorani came to Okinawa from India through Ghana 10 years ago, and says Okinawa for him is the best place to live. “Life here is much better than other locations where I have been. Especially I appreciate the friendly people that make living so easy here.” He also likes to go out to different places with his family. His hobby is his watch collection. He won a \2,500 discount ticket to Jason Arbocast Photography. 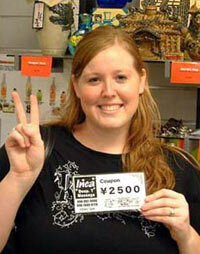 Meagan Mead from Rossville, Kansas, won the \2,500 discount ticket to Kupu Kupu Spa. She says that although she has been on the island only two months she enjoys the island and “can’t wait to explore more.” She is pregnant with twins that are due in December, She says that with her family she often explores the island by picking up a site from Okinawa Guide or a website, and especially favors pools and beaches as her son loves playing in water. Tuesday also was her 27th birthday.